In the 1760’s, Johnstown was located at the intersection of six Indian trails. Sir William Johnson secured peace among the Indians and built an empire here in the Mohawk Valley. He built a school, churches, forts, farms and a town. 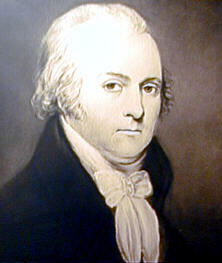 Sir William Johnson died just a year before the beginning of the Revolutionary War. In January 1776, an American force of about 3,000 men under Philip Schuyler and Nicholas Herkimer disarmed his son, Sir John Johnson and his followers. A few months later, fearing capture, they escaped into Canada. The course of American history would have been much different had Sir William Johnson been alive when the Revolution began, but he died at an Indian conference in 1774. Even collectively, his successors could not fill the void, though they did their utmost for the British Crown during the Revolution. Sir William’s son, Sir John inherited his title. In 1776, fearing an attack by the revolutionaries, he fled to Canada and organized a Loyalist regiment. He was with St. Leger in the attack on Fort Stanwix in 1777 and led a large-scale raid on the Valley in 1780. Perhaps the most dreaded foe of the patriots was the Mohawk Joseph Brant. Cultured, religious and well educated, he remained an Indian patriot and fought tirelessly against the rebels. He felt that the Iroquois would have a better chance of preserving their way of life under British rule than under the land-hungry colonists. In March 1778, Schuyler returned to Johnstown in an attempt to seek neutrality among the Indian tribes. The council with the Indians was, for the most part, unsuccessful because most of the tribes were already in alliance with the British. In a prelude to the Great Raid of 1780, Sir John Johnson and his small army of Tories and Indians invaded Johnstown on May 21, 1780. Their raid began at midnight when they entered the town and systematically killed local patriots and destroyed their homes and property. Local Tories, who had an early warning about the raid, assisted with the raid on their fellow neighbors. After Johnstown, the raiders continued their destruction south to the Mohawk River then returned to Canada with their captured booty. Raiders would return one more time in October of 1781 and be challenged by American forces at the Battle of Johnstown, one of the last battles of the Revolutionary War. 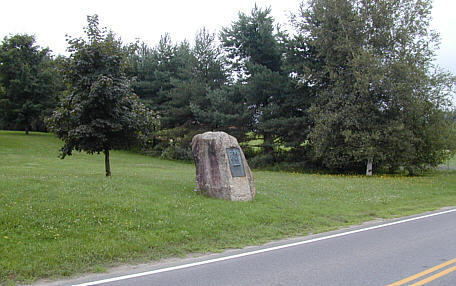 The battlefield is an upcoming site on a recommended tour of Johnstown that follows. The first site is the Johnstown Courthouse. 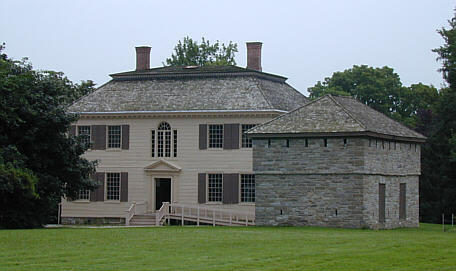 It is the only Colonial courthouse still in use in New York State. Bricks used to build the courthouse were shipped from England, arrived by boat in Albany and traveled to Johnstown by wagon. The first court general sessions, Tryon County, September 8, 1772. Aaron Burr tried a case here in 1812. 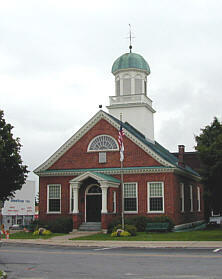 Johnstown Courthouse — The courthouse can be found at the corner of West Main Street and North Williams Street. Prior to the Revolutionary War, the court house served, what was at the time, Johnson’s great County of Tryon. The cornerstone was laid in 1772 with the “attendance of British officers and soldiers,” which “gave dignity … to the event, while over all the group, asserting the power of the Crown, waved the broad folds of the British Flag.” It is clear from this description, that, Johnstown would be severely split by the Revolution. Today, the courthouse serves as the Fulton County Courthouse. This is the oldest dwelling in Johnstown. The only survivor of six similar structures built by Sir William for his staff. Here lived Edward Wall, schoolmaster of the first free school in the colony of New York. 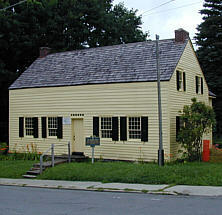 The Drumm House — Built in 1763 by Sir William Johnson, it is the oldest dwelling in Johnstown. It was the home of Edward Wall, schoolmaster of the first free school in New York. Commemorating the first veterans of our nation who fell in the Battle of Johnstown. One of the last battles of the American Revolution, October 25, 1781. Erected by the Fulton County Veterans Council in conjunction with the Fulton County Bicentennial Commission in the year 1976. Sir William Johnson Park — Sir William Johnson sponsored the construction of the original church on this site. Johnson’s burial site, which was once inside the old church, is now outside the current structure in Sir William Johnson Park. 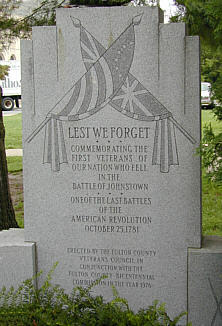 Also in the park is a monument placed by the Fulton County Veterans Council noting the Battle of Johnstown as one of the last battles of the Revolutionary War. Besides, Sir William Johnson, Johnstown is also noted for another of its past citizens. Across from Sir William Johnson Park on North Market Street is the site of the birthplace and home of Elizabeth Cady Stanton. She made her call for liberty, full women’s suffrage. Gaining considerable knowledge of Indian affairs, his area of responsibility for administration reached from Hudson’s Bay Canada, to the Carolinas, from the Atlantic to as far west as any Indians were known. Appointed to deal with Indians, and because of just and honest treatment of them, his influence of Indian power was tremendously important to colonial governors and their colonies. He effected the surrender of Pontiac, at Oswego in 1766, thereby ending the Pontiac conspiracy. Moving to Johnson Hall at Johnstown, NY in 1769 his fourth and last home, he conducted very important councils with many Indians who came to speak to him, at times numbering 1000 individuals. Here, he died, on Sunday, 11 July 1774, after holding an important Indian council. He died as he had lived, admired and trusted by the Indians, respected by the military and civil officers of the colonies, and a great credit to the public trust reposed in him. 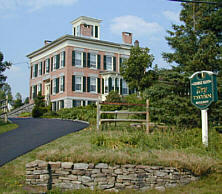 Johnson Hall — It was from this home that Sir William Johnson presided over his Mohawk Valley kingdom. He died here during an Indian council with the Six Nations. During the council, he made it clear that he was opposed to the movement toward revolution. For the most part, his son and the Six Nations carried forward his legacy throughout the war. The Battle of Johnstown was fought October 25, 1781. American forces were led by Colonel Willett. The British forces were under Major Ross and Captain Butler. This site commemorates the last battle of the Revolutionary War — fought six days after General Cornwallis surrendered to General George Washington at Yorktown. Battle of Johnstown — The battlefield marks the end of an October 1781 raid through parts of the Mohawk Valley by British forces composed of Indians, Tories and British troops led by Major Ross and Captain Butler. After raiding areas to the east and south of Johnstown, the British forces were attacked by American forces led by Colonel Marinus Willett. Willett divided his forces and approached the British forces from the front and rear. The frontal attack was first repulsed, but the rear force held and after reorganizing, a second frontal attack forced the British into retreat. The American forces pursued the retreating British. They were able to overtake and rout them. The battle was an American victory, fought six days after the victory at Yorktown, one of the last battles of the Revolutionary War. 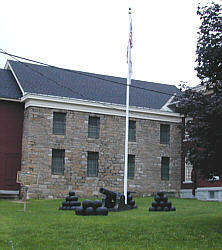 The fort was built in 1774 by Sir William Johnson to fortify the village and it was used by loyalists during the Revolutionary War as an important civil and military prison. It was inspected by General George Washington in 1783. When the canon and balls were placed as a memorial in 1900, the canon balls had to be welded together to prevent pranksters from rolling them down Perry Street hill. Fort Johnstown — During the Revolution, Fort Johnstown was stockaded and was a stronghold. It was also used as a jail for captured enemy. At the end of the Revolution, the fort was inspected by George Washington on his Mohawk Valley tour..
Intersection with US Route 20 -- About 25 miles to the west is the town of Cherry Valley. On November 11, 1778, Captain Walter Butler and two Tory companies (the same Captain Butler that was one of the leaders of the British forces at the Battle of Johnstown) along with Joseph Brant and 500 Indians attacked and destroyed the town. Many villagers, including women and children, couldn’t make it to the fort. They were killed and scalped by the Indians. The fort held but about 50 villagers were killed. Also to the west is Cobleskill. On June 1, 1778, Brant led a raid on the town and drove off the defending Continental troops killing Captain William Patrick, their commanding officer. The Indians then massacred many of the town’s settlers. Tory Tavern -- The tavern is appropriately named. During August of 1777, the Schoharie militia was called-up to join the forces opposing Burgoyne’s invasion down the Champlain and Hudson Valleys. Captain George Mann was the leader of the militia. However, in a surprise announcement, he declared himself “a friend of King George.” Mann drew some followers from his assembled troops and joined a band of loyalists being raised through the efforts of Sir John Johnson. The loyalists seized control of a good portion of Schoharie Valley. Today, the Tory Tavern is a popular area restaurant and is highly recommended. The wait-staff dress in period costume..